An eastern phoebe provided the introductory music to the field trip last Sunday at Spring Canyon, located near Torreya State Park. Seventeen Audubon members joined landowners Helen and Tom Roth to your their 100 acres of Apalachicola uplands. Restored longleaf pine/wiregrass uplands on Helen and Tom Roth's property. Helen spearheaded restoration efforts on her land, seeking to return the ecosystems back to what they were before fire suppression, logging, and invasive species took their toll there (and almost everywhere else in Florida). Helen toured us around areas where she had been burning, planting longleaf pines, pulling invasive plants, and cutting trees that had invaded what once were open, park-like forests. The birds were surprisingly inconspicuous, but we were still able to locate many interesting wildlife species. A grizzled mantis scuttled up the trunk of a longleaf pine. Ground skinks, green anoles, and eastern fence lizards gave us regular forest-floor entertainment. While exploring the edge of an impoundment, the largest cottonmouth I've ever seen (and I've seen plenty) slowly slithered away from us. A blurry photo of the largest cottonmouth I've ever seen. It was approximately 3.5 feet long. Steepheads on the property supported Appalachian plants such as mountain laurel and Matalea alabamensis, along with interesting species such as Apalachicola dusky salamanders (I observed five on Sunday). In addition, they offered relief which was apparent when we stopped at an eroded cliff face and when Helen kindly warned me to stay back from the edge of the cliff while we were hiking. An imperiled plant, Matalea alabamensis, grows on the edge of a steephead. Landowners like Tom and Helen, in many respects, represent the future of conservation. We can protect all the public land we want but, with a growing population, what people do in their own backyards will dictate the survival of many species. I found it inspiring to see people dedicate their lives to helping our world. Aucilla Wildlife Management Area (WMA( occupies over 50,000 acres of Jefferson County, just a few miles east of the Tallahassee city limits. The area contains well-managed upland forest, pine flatwoods, much of the Wacissa and Aucilla Rivers, and...caves. Lots and lots of caves. The substrate sits atop a bed of limestone, a porous mineral susceptible to the carving powers of water. This is evidenced by the many karst features found in this WMA. I love caving. It's probably my favorite thing to do, but it isn't always conducive to birding. However, every once in a great while, two of my favorite hobbies can be combined into one. That was the case a couple of months ago when I joined my friend, Matthew Bull, from the Flint River Grotto, a local caving club, to search for caves in a remote part of the WMA. The heat was oppressive as we bushwhacked through thorn bushes and dense vegetation. As no cave materialized, I began to lose my patience. "Matt, are you positive about the direction we're going?" I asked. "It seems like we've been going in circles." And, it turned out, we were. Now, normally, this would not have been a huge deal, if a little inconvenient. But we had already reached wits' end. Earlier, Matt had looked down at his pants and noticed hundreds of crawling arachnids. No, these weren't ticks as he originally thought. I knew better. These were chiggers. The pace picked up and the caves seemed less important now. Still, we were determined. I began to notice small exposures of limestone here and there, and my cave sense began to tingle. Sure enough, the entrance to the largest of the caves we were to visit that day was less than thirty feet away. What would a cave be without giant spiders? I peered into the hole that disappeared into the side of a sinkhole. The water levels were too high to go very deep, but I poked around the entrance. Unusually, the water was crystal-clear. This meant that the water in this cave was directly tied to the water table and not the underground Aucilla River that flowed somewhere under our feet nearby. I peered around the mossy crevices associated with the entrance. A large fishing spider scuttled away into one deep crevice. A southern cricket frog leaped into a pool of water. And then I saw something shocking. In an upper crevice of the entrance passage, I spotted a nest. This nest was composed of moss and short twigs, and had a perfectly-round shape. I knew immediately what it was: the nest of an Eastern Phoebe. Now, this may not seem that unusual. We see Eastern Phoebes all the time. But, according to FWC cave research, Jonathan Mays, only six nests have been documented in the state in recent times. All of these were in cave entrances in Jackson County, near Florida Caverns State Park. We had talked previously about the possibility of phoebes nesting in other Florida caves but, until that day, that was just a theory. First documented nest of an Eastern Phoebe in Jefferson County, Florida. Matt and I were both excited but had other things on our mind at this point, namely the hundreds of chiggers actively creating hardened feeding tubes in our flesh. We found our way back to our vehicles, drove to a boat landing on the Wacissa River, and jumped into the cool, spring-fed river with our clothes on. We checked in with each other a few days later. Yes, we were both covered in chiggers. No, they were not getting better. But, hey, at least we found a phoebe nest. Birding brings out the best of any occasion, it seems. 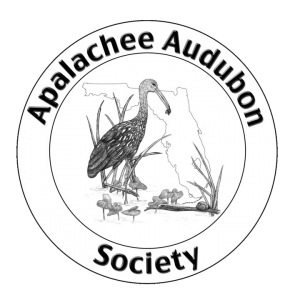 We are asking members of Apalachee Audubon to join us in writing letters to our elected representatives, requesting that the Florida Forever funds we voted to be used for land acquisition to...be used for land acquisition. A short letter is better than no letter at all. Be personal. Share examples of how this will effect you, and your family. If you cite facts, back them up. Tie environmental issues back to economics and jobs. State that you plan to talk to others and spread the word about this issue among other constituents. Sending a letter is better than an email, but both can be effective. You may not receive an original response, but that does not mean that your letter had no impact. More information on Florida Forever and talking points to include in your letter can be found here. Sometimes birding is more than just listing the species that you see. It includes paying attention to how birds behave. Recently, I was surveying shorebirds on Stony Bayou I at St. Marks NWR and had already made my way halfway around the pool. I saw a group of about a hundred shorebirds and finished counting the nearby Black-bellied and Semipalmated Plovers. I turned my attention to a large group of peeps and noticed that all of the previously counted peeps from the other side of the pool were flying in to join them. Suddenly, all the peeps took off. Now, when shorebirds take flight, there is probably a reason. It could be that the tide is changing the water depth or a potential predator is flying overhead. I watched as the peeps scattered in twisting murmurations. In this case, their flight turned out to be due to a fast-closing Peregrine Falcon. Always good to look up. Looking for the closer plovers, I noted that they hadn’t flown. The Semipalmated Plovers had gone belly deep in the mud; keeping a low profile. The Black-bellied Plovers had been walking in shallow water and had crouched as low in the water as they could without resorting to snorkels. The plovers’ strategy had been to hide and let the peeps get chased by the Peregrine. Continuing my shorebird survey, I made my way down to the lighthouse. I could see that there was a group of larger mixed shorebirds out on the salt flats to the East of Lighthouse Pool. I parked and walked up the stairs of the viewing platform just as a Peregrine Falcon (probably the same bird, it had the same juvenile Tundra plumage) flew in low over the salt marsh. It was late afternoon and with the sun at my back the falcon was spectacular. I tracked it through my binoculars as it swooped low over the salt marsh and flew away. When I looked for the shorebirds, most had flown. There were Willets frozen in place that had not moved. As I watched, six Black-bellied Plovers flew in and landed. Now, I believe that the Plovers had been part of the group of shorebirds that I had seen before the Peregrine arrived. This time of the year, Black-bellied Plovers can usually be found on those flats. Why hadn’t they hunkered down like the plovers that I had observed earlier? I had seen no peeps with this group. Does a plover’s threat assessment include available decoys? Did the Willets rely on the plovers to distract the Peregrine? I don’t have any answers. However, observing bird behavior and confronting challenging questions does as much to keep me birding as the thrill of finding uncommon species. “California Gulch is the most accessible place in the U.S. to see Five-striped Sparrow, yet it is no easy place to get to. The single-lane road has many rough sections and wash crossings; a 4-wheel drive, high clearance vehicle is strongly recommended. If possible, go with someone who knows the way; road signs may be missing or misleading. The best birding spots are four bone-jarring miles from Ruby Road. As in all isolated areas, do not travel alone. The road is seldom maintained.” Finding Birds in Southeast Arizona, 8th edition. I was taking advantage of a field trip offering at the Tucson Birding Festival for a day’s birding that would start with an early morning run through California Gulch. August is hot in Southeast Arizona. The forecast high in Tucson was 104 degrees, but it’s the best time to see rare and uncommon birds like Five-striped Sparrow, Buff-Collared Nightjar and Montezuma Quail. Down along the Mexican border, west of Nogales where we would be birding, it would be cooler, with temperatures peaking in the mid-90s. I was staying at the Riverpark Inn in Tucson on the banks of the Santa Cruz River. The birding festival is centered at the Riverpark Inn and it was an easy walk from my room to the lobby and then out the front door. There was a line of vans, each heading out for a different field trip. I followed a sign to one of the two “California Gulch Adventure” vans, checked in and got on the van. It was still dark, but we had a 1.5-hour drive just to get to the turnoff to California Gulch Road. Our scheduled leave time was 5:00 am. This was a small group; fourteen birders and two leaders in two vans. I’m dressed like an REI ad; breathable lightweight shirt and pants, floppy sun hat and hiking boots. I fit right in. Everybody has binoculars; some have expensive cameras. There’s probably $50,000 worth of optical equipment in the vans. The group is a mix of in-state and out-of-state birders, mostly older, but all fit. There’s a mother-daughter pair and a married couple, the rest of us are single birders. It’s a 30-mile drive in the dark down I-19 to exit 48, Arivaca Road, and then another 23 miles to the town of Arivaca. We drive down the interstate in the dark, turn off on our side road and head out across the desert. The sun decides to rise as we drive down Arivaca Road. Arivaca is a small town with 35,000 inhabitants on a small perennial stream. It started as a Pima Indian village and developed because of small mines in the area that produced gold, silver, lead, copper and tungsten. It has the oldest schoolhouse in Arizona and has been a stage stop and cavalry outpost. The cavalry outpost was established after Apaches under Geronimo attacked isolated ranches in the area during the Bear Valley Raid in 1886. Arivaca’s cavalry made history in 1918 when they engaged a small band of Yaqui Indians in the Battle of Bear Valley; the last armed engagement of the Indian Wars. Troop B of the Connecticut National Guard was stationed here in the 1920’s to guard against raids by Mexican revolutionaries, but saw no action. At Arivaca, we follow the signs for Ruby and turn on to an unpaved road for the 10-mile drive to the turnoff for California Gulch. Ruby Road is named after the wife of the mining town’s general store manager. The town of Ruby folded in 1941 and is now a ghost town open for public tours. California Gulch Road is easy to miss. It’s not so much a road. It’s more like a place where people have driven before. The two leaders, Brian and John, are both pros who lead international birding trips. They talk using walky-talkies and it seems that they are less familiar with current conditions than one would hope. It’s monsoon season in Southern Arizona with torrential rains and flash floods in the desert and it rained heavily yesterday. I’m in the lead van and we stop when Ruby Road goes underwater for about twenty feet. After a short discussion, we decide to chance it and make it through. Brian decides that California Gulch Road will be impassable and we turn onto Warsaw Canyon Road, which runs into the bottom of California Gulch just shy of the Mexican border. The Sonoran Desert in monsoon season is a riot of lush greenery bespotted with flowers. Velvet Mesquite and Whitethorn Acacia are the dominant plants, but there are oaks along the southern hill flanks, valleys rich with Arizona Walnut, Fremont Cottonwood, Sycamore and Willow, Ocotillo forests on exposed slopes and, in the open, a mix of cacti; cholla, prickly pear and saguaro. Grasses and wildflowers form a carpet underneath everything. We run into Antelope Jackrabbits; bizarre, ungainly creatures with giant ears. There are birds too; Gray Hawks, Rufous-winged Sparrows, Cassin’s Kingbird and Phainopeplas. We bounce up and down as the vans navigate the road. This is open range and we see the occasional cow and even a few horses. California Gulch is a narrow watercourse in a lush valley. We exit the vans and within an hour we have found Five-striped Sparrows, Blue Grosbeaks, Black-tailed Gnatcatchers, Western & Summer Tanagers and Yellow-billed Cuckoos. There are Canyon Wrens, Varied Buntings and Vermilion Flycatchers. This is hot birding in every sense of the term. We also run across butterflies like the Empress Leilia (not a Star Wars character) and dragonflies like the Variegated Meadowhawk. We also run across the Border Patrol who show up everywhere. A lone pickup with the standard wide green diagonal stripe that identifies Border Patrol vehicles came driving down California Gulch Road making the California Gulch/Warsaw Canyon loop, undeterred by water and mud. He takes one look at us and keeps driving. Having found our target bird, we head back up Warsaw Canyon and take Ruby Road over to the head of Sycamore Canyon to stop for lunch. This is Hank-and-Yank Spring. It’s named for neighboring ranchers who survived the Bear Valley raid, but lost family members. For us it’s a pleasant and shaded place to have lunch. There are Black-headed Grosbeaks, Warbling Vireos and Rufous-crowned Sparrow. The rest of the afternoon is spent at Pena Blanca Canyon and Willow Canyon. We add Dusky-capped Flycatcher and Greater Roadrunner and then head back to the interstate to begin the drive North to Tucson. I’ll tell you; feeling intense fear and peace at the same time is a strange emotion. Certainly, it isn’t one that I experience often. To be fair, it isn’t often that I’m standing in a totally unique landscape, with the calls of unrecognizable birds echoing around me, all while looking over my shoulder in a place where violent crime is not uncommon. Looking across the Rio Grande to Mexico at dawn. I was standing on the banks of the Rio Grande in Salineño, Texas. As a part of my Lower 48 Big Year, I was to spend the day birding in extreme South Texas where tropical birds like Altamira Orioles and Buff-bellied Hummingbirds barely penetrate the United States. Due to a fortuitous happenstance involving a flight attendant friend, I can fly anywhere in the U.S. for free. And, whenever I can, I do. I hiked down this old trail, strewn with water bottles and caches of supplies for crossing migrants. Fighting exhaustion from flying all day, sleeping for three hours, and driving two and a half hours in my rental car to this tiny riverbank village in the middle-of-nowhere, I struggled to locate birds. I recognized zero calls and the thick vegetation made locating birds a challenge. I only count the birds that I see, partly to make the Big Year more difficult and partly because I like to see birds. The various species seemed to be mocking me. Was that, “Hey, stupid, Mexico is 75 yards away and this is one of the most common border crossings sites there is!” that I heard? Believe it or not, I justified spending the early morning hours alone in this dangerous place to myself. After all, this was one of the only places in the U.S. where White-collared Seedeaters, Red-billed Pigeons, and Audubon’s Orioles could be found. Plus, it wasn’t filled with people like most other major birding sites within the region. It met my criteria. An extremely-rare old growth Montezuma cypress grows along the Rio Grande. I veered off the path and bushwhacked through thorn-scrub along the river bank until I reached one of the only old growth Montezuma Cypress trees growing in the United States. The massive limbs dangled above me and above the brown water that many people vehemently opposed to immigration have never laid eyes upon. Among the leaves, Groove-billed Ani’s, Green Jays, Brown-crested Flycatchers, and a Great Kiskadee went about their lives as if they were in Mexico. They had no idea how rare they were in the U.S. To them, this was just another tree. To them, there was no border. I stood there, smiling, until a couple tears fell down my cheek. My girlfriend had broken up with me two days before. I had just received disturbing news about my health. My financial situation, due to a couple unfortunate accidents, was abysmal. And yet, it was all ok in that moment. The birds seemed to speak for all of nature. “We’ve got you”, they said. “Don’t forget why you’re here,” they advised. “Enjoy these rare moments,” they directed. The Rio Grande, looking south towards Mexico. So what if I didn’t stumble upon any Red-billed Pigeons or Audubon’s Orioles? I found something far better. I found an inner peace that, however temporary, reminded me there is so much to love about this world. The birds, it seems, knew this all along. Or at least I thought that’s what they said. A great egret perches on the edge of the Wacissa River at the Aucilla WMA bioblitz. Photo by Emily Ellis. What the heck is a bioblitz? A bioblitz consists of various teams made up of members of the public going out with taxonomic group experts to search for as much life as possible, within a set geographic area, within a set period of time. On May 6, the Florida Fish and Wildlife Conservation Commission held just such a blitz at Aucilla Wildlife Management Area in Jefferson County. Groups searched for birds, plants, reptiles/amphibians, and insects. The bird group was led by Apalachee Audubon members Budd Titlow, Don Morrow, Rob Williams, and Dana Bryant. They were joined by Scott Davis, a St. Marks National Wildlife Refuge ranger, who assisted with plant identification. 33 participants, ranging from 9-year-olds to grandparents, trekked on trails, forest roads, and through the forest in search of life. Each team surveyed for all taxonomic groups and had the opportunity to visit three different natural communities. Groups checked traps for turtles and cave invertebrates, paddled down the Wacissa River in search of birds, and netted butterflies feeding on roadside flowers. Life (including ticks) abounded. Participants cataloged their finds using iNaturalist, as part of the Florida Nature Trackers program. This data will ultimately be shared with FWC biologists and the Florida Natural Areas Inventory in order for them to better understand, and conserve, the life found on the area. My first hike in Florida took me to an improbable place. I hiked through recently-burned sandhill, through shaded steephead ravines, and back up through a scrubby oak forest in The Nature Conservancy’s Bluffs and Ravines Preserve. All the while, I had my head down looking for snakes or way up while looking for birds. The cliff seemed to come out of nowhere. Before I knew it, I was looking out to the horizon that seemed hundreds of miles away. I was looking out over the upper Apalachicola River floodplain from Alum Bluff. This rise above the chocolate-brown waters of the Apalachicola River represents the highest cliff in Florida. The precipice descends 130 feet to the river. From its heights, you can see the shadows of gar swimming in the water and flattened shells of moving with the current. No buildings mar the view looking west. It’s just forest. A recent change in ownership has left this floodplain forest, and nearly 40,000 acres of similar floodplain forest, steephead ravines, and upland forest available for protection. All told, over half of the non-tidal portion of the riparian area of the Apalachicola River transferred to new ownership. With it comes new opportunities. Well-managed sandhill habitat in the upper Apalachicola River basin. Apalachee Audubon, The Nature Conservancy, and Apalachicola Riverkeeper have all suggested that the state of Florida preserves this species-rich land through a conservation easement. Conservation easements give land owners benefits for leaving portions of their land undeveloped. The state would theoretically compensate The Forestlands Group, the new owners. The legislature recently passed a budget that provided the Department of Environmental Protection (DEP) a grand total of $0.00 for land purchases in 2017-2018. Over 70% of Florida voters supported Amendment 1, which was originally understood to support land acquisition efforts. Instead, the Amendment has mainly funded water infrastructure projects and agricultural initiatives. The recent budget left many scratching their heads but environmental groups, such as ours, have not given up when it comes to getting biodiverse land conserved. On June 16, a presentation will be held regarding whether or not the Acquisition and Restoration Council of DEP should review the property for inclusion on its list of potential properties to purchase. Want to help? There will be opportunities for letter-writing, phone calls, and public participation in hearings. The more people that show support, the more likely we will be able to work with our partners to make this easement happen. We hope you will help us ensure that the prothonotary warblers that sing, the wood ducks that nest, and maybe even the ivory-billed woodpeckers that elude us may continue to do so in this important tract of land indefinitely. We’re talking about Florida Forever, after all.